On the 7th-8th September, Sefton Park will spring into action once again to host the annual Liverpool Food and Drink Festival. This year, some igoo favourites will be exhibiting, offering you the chance to taste all manner of culinary delights and treats. 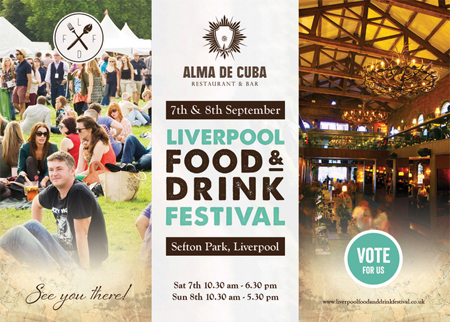 With stands from Alma De Cuba, Matou and Chy restaurant, you’ll be spoilt for choice. There will also be a hotly contested, cocktail competition held on Sunday featuring igoo clients Santa Chupito’s, El Bandito, 81 LTD and Alma De Cuba. You can vote for your favourite Liverpool business in a range of categories so follow the ‘Awards’ tab on the main festival site here and get registering your thoughts.